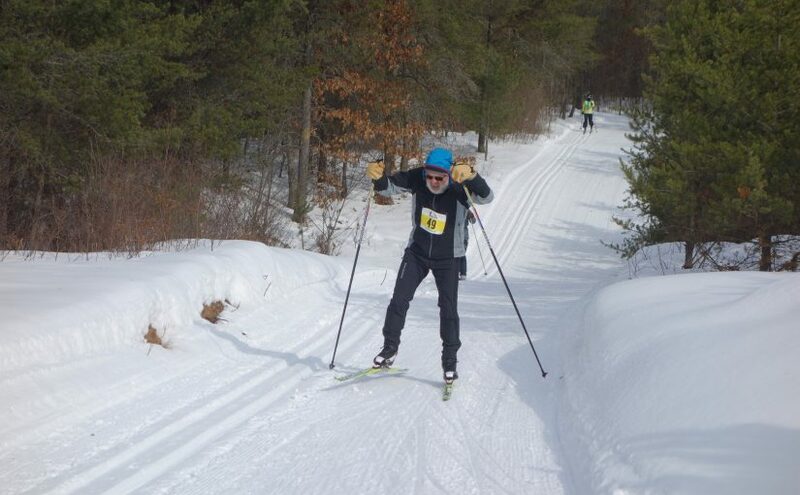 Individuals, ages 15-70+: Medals will be awarded to the top two males and top two females in each of the following age categories in both classic and skate ski divisions: 15-19; 20-29; 30-39; 40-49; 50-59, 60-69, 70+. Award plaques to the top male finisher and top female finisher overall in each ski division. 3-Person Relay: Three people will each complete one leg of the course. A plaque for each member of the top relay team in both the classic and skate ski divisions will be awarded. All athletes finishing the race will receive a participation medal. A soup luncheon including: soup, chili, rolls, cookies and beverage will be served at the Manito-wish Leadership Center for the participants, their friends and family, as well as the general public. Participants will receive lunch and beverage by showing their bib. Please note: Camp Manito-wish YMCA is an alcohol-free facility. Enjoy adult beverages after the race in one of our local establishments. Family and friends may purchase food for a small fee. Relax and enjoy the fun with your family and friends! Friday & Saturday Afternoon/Evening: Check out Boulder Junction’s quaint and historic downtown. Visit local shops and galleries. On Friday evening Aqualand Ale House will be serving a pasta feed. All other restaurants will be open and serving regular menu including Friday Fish Fry. Friday, Saturday and Sunday enjoy a Tavern Tour throughout Boulder Junction. Stamp your card at all 7 locations and enter to win a complimentary entry to the 2020 Forest Frenzy Winter Triathlon! Businesses participating in the Tavern Tour are: Aqualand Ale House, Boulder Beer Bar, George's Pub, Gooch's A-1 Bar & Grill, Headwaters Restaurant & Tavern , Wittig's Point Resort & Tavern and McGann's Pub & Wine Bar Sunday Fun Day: Make it a weekend to remember and enjoy! Attend the Boulder Junction Snowmobile Club Breakfast between 8:30am and 11am at Headwaters Restaurant. Ice Fish any of the 194 beautiful lakes in the 10-mile radius of Boulder Junction. Snowshoe, Cross-Country Ski or Fat Tire Bike any one of the many area trails. Enjoy a breakfast or lunch at a local restaurant. Shop the unique Boulder Junction area stores all day at your own leisurely pace. Detailed information and trail maps can be found right here on our website or calling the Boulder Junction Chamber at 1-800-GO-MUSKY. Bike helmet, bike, snowshoes, cross-country ski equipment, and cold weather clothing. Please note: Conditions will dictate the best choice of equipment. Please check the weather forecast here. Trail conditions will be posted when the snow flies. Filled beverage/water bottles, a smile and great attitude! No waxing equipment or space with be available on-site. Race officials will monitor the weather and course conditions closely the week of the race. We will keep participants aware of any alterations to the schedule or alert registered athletes if the race has been postponed or cancelled via email and Facebook notifications. All or any part of the race may be delayed or cancelled due to severe weather conditions. If weather is favorable, but trail conditions are poor, the race may be modified. In this event, notification to registered triathletes would be made via email and Facebook notifications. The triathlon will be cancelled if the high for the day is -5F or colder. The triathlon will be postponed 1.5 hours if the high at the starting time (9:50am) is forecast to be -10F. Please dress for all-weather conditions and plan accordingly. NO REFUNDS will be issued if competition must be modified, shortened or cancelled due to weather conditions. Registered triathletes will receive their participant gift, if picked up in person, or they can be mailed upon request only. Forest Frenzy courses are not your typical winter races trails. These trails are tucked in the tall trees beginning at Camp Manito-wish YMCA and leading into the Northern Highland-American Legion State Forest. We have widened existing trails to accommodate the race. You will find that this is a challenging wilderness endurance event with some tight turns and narrow areas. Some of the course does cross other public use trails. The race begins promptly at 10am at Manito-wish Leadership Center. The race time limit is set at 1:50pm. If any participant has not passed the finish line and exceeds this limit, they will be disqualified to receive an award medal but can continue to complete the course and receive a completion time and participation medal. Failure to heed the commands of a race official means disqualification. Camp Manito-wish Leadership Center, 5650 Camp Manitowish Lane on Friday, February 14 from 1pm to 4pm and Saturday morning from 7:30am to 9am. Walk-in registrations accepted until 9:00am on Saturday February 15. Photo ID required! Racers will pick-up their race packet and may ask questions about the course and event. Trail Preview: Trail preview is from 1pm to 3pm on Friday, February 14. We will be grooming the course Friday evening and do not want racers using the trail after final grooming. Warming Route: Do to logistics at Camp Manito-wish YMCA, we are not offering a warming route on-site. The parking area is 1/4 mile from the staging area so you will have an opportunity to run for warm-up if you would like, or off-site trails could be used prior to arrival. Waxing Area: The is no indoor waxing area available. We advise that skis should be waxed in advance. For classic skiers only, a short kick wax test trail will be located near the Camp parking lot for your use prior to the race on Saturday morning from 7:30am to 9am. This trail is noted on the course map and entrances to the trail will be marked with orange cones. Race begins promptly at 10am at the start line near Manito-wish Leadership Center. Waves will be assigned at orientation. Waves consisting of 2 triathletes will be released every 30 seconds. Expert levels will start in 1st waves, followed by intermediate then beginners. The Finish line is at Manito-wish Leadership Center and we expect to conclude on or around 1:50pm. Followed by an awards ceremony when the last racer crosses the finish line. Soup, chili, rolls, cookies, hot beverages, bottled water and fruit will be available at the finish line for all participants upon completion of the race. Complimentary massages will be available after the race from Boulder Junction Wellness and Calming Stone Massage. The Awards Ceremony will be held inside Manito-wish Leadership Center after the last racer crosses the finish line. Participation medals will be awarded to all athletes completing the triathlon as an individual or relay team participant at the finish line. Check out Boulder Junction’s quaint and historic downtown. Visit local shops and galleries. On Friday evening Aqualand Ale House will be serving a pasta feed. All other restaurants will be open and serving regular menu including Friday Fish Fry. Sunday Fun Day: Make it a weekend to remember and enjoy! Safety and First Aid Stations: In the case of emergency, call 911. Safety and first aid stations will be available at the transition/finish line staffed by volunteers from the Boulder Junction Fire Department and EMTs. There will be a warming hut at #51 were the ski/bike and snowshoe course intersect. Race sweepers will be on the course throughout the event. It is your job as a participant to help another racer if they are in distress and need help.